A new Polis report by Petra Olsson considering the ethical and editorial dilemmas of crisis journalism. This report was produced as part of the Polis Newsroom fellowship scheme with the Swedish news media foundation, Journalistfonden. Read the introduction to Rescue or Report? below, and read the full report HERE. Journalists usually try to be observers, but recently something has changed. We now increasingly see journalists living the story rather than just telling it. Is this good or bad news? Discussions around journalists getting involved are nothing new. The debate was reignited during the devastating 2010 Haiti earthquake, when we saw journalists such as CNN’s Anderson Cooper intervening to rescue a boy. Some medical correspondents started to act as surgeons. The BBC journalist Matthew Price found himself helping a woman who was about to give birth. Recently, news organisations covering the ’refugee crisis’, a major humanitarian story with many people fleeing from war and terror, have been surprised by the emotional toll it has taken on their journalists. The refugee crisis has been different in the sense that many of the journalists have found themselves reporting from a position of safety about people in very difficult circumstances in their own ’back yard’. They are not always comfortable with that. This has sparked an ethical debate about the responsibilities of journalism and the nature of ’objectivity’. It has also shaped new ways of reporting. One of the boldest examples was the Yellow Boats (Gula Båtarna) Project, a collaboration between the media company Schibsted and the Swedish NGO the Sea Rescue Society. 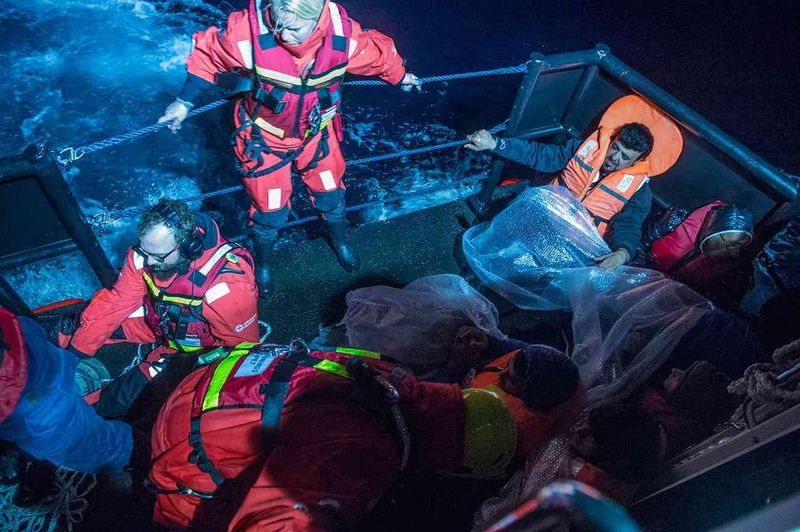 It began in October 2015 when the two organisations teamed up to save the lives of refugees in the Mediterranean. 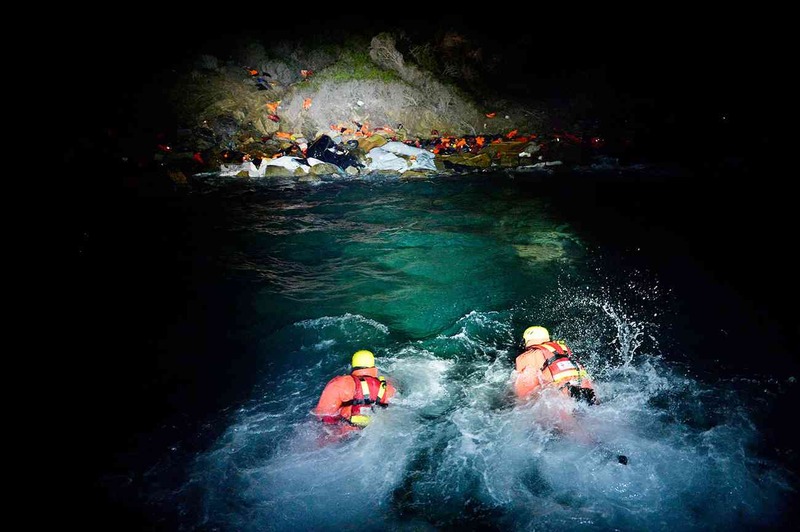 Over six months, two boats assisted the Greek Coast Guard in lifesaving efforts. Schibsted collected money from individuals and companies to fund the operation. The Yellow Boats campaign stirred debate because it involved journalists stepping in to participate in the migrant rescue operations, challenging the idea of the ’impartial’ observer. Here, we suddenly had a media organisation not only involved in running a life saving venture but also with their journalists pulling people from the sea. Yellow Boats is only one example where the lines between the journalist as impartial observer and the journalist as participant is becoming blurred. This report will address the challenges that this trend presents. Do we need to draw a line, and if so, where? The first section looks at interventions during the Haiti earthquake and describes the debate that followed. By recapitulating the 2010 debate it is also possible to situate more recent cases of involvement in a wider ethical discussion. The second section explores how the refugee crisis in Europe presents new challenges as journalists are finding themselves reporting on people in dire circumstances from a position of safety. The scale of the crisis allowed media organisations to send a mixture of people to cover the crisis who would see tragic scenes unfold in front of them. Some reporters have found it hard to report from a position of safety and decided to intervene. The section discusses different examples and the choices being made. The third section looks at the Yellow Boats Project. The case study is based on interviews with around 15 participants of the project as well as media ethicists and researchers. The main aim is to discuss the ethical and professional dilemmas that arise when a media organisation becomes engaged in a joint journalistic and humanitarian project. Reporting on the difficulties of the campaign and ethical concerns around consent and live coverage, are some of the issues that emerged. Finally, the report discusses how involvement aligns itself with different media brands. What is at stake when you get engaged in an operation as a media organisation? What sort of responsibilities comes with projects such as Yellow Boats, to follow up in the long term? In the fourth and final section, the paper also explores transparency issues and the importance of evaluations so that experiments such as Yellow Boats can serve the journalistic profession. In this film, Polis Director Professor Charlie Beckett looks at how news reporting is changing, touching on the research findings of Rescue or Report? This report was written by Swedish journalist Petra Olsson as part of the Polis/Journalistfonden Fellowship under the supervision of Professor Charlie Beckett at the LSE’s Department of Media and Communications with research assistance from LSE MSc student Fiona Koch.